The city of Cottage Grove in the gorgeous Willamette Valley of Oregon is typical of the middle of Oregon. It’s a small, quiet, yet extremely historic town. As such despite it’s rather small population, it has two fairly good museums. Being fairly important in the Gold mining days and with the Bohemia Mining district near by history practically seeps through the town. 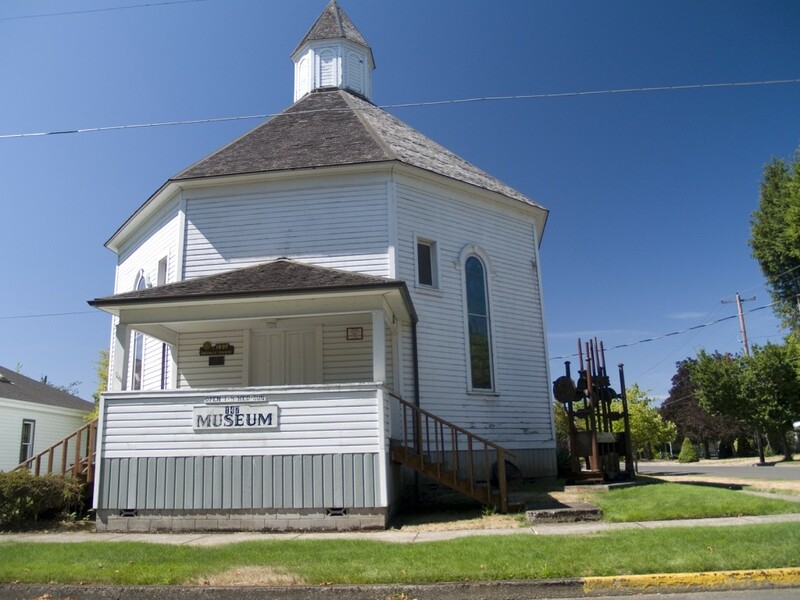 This museum is described as the “Cottage Grove Museum,” and supposedly has a good collection of logging, mining, and Native American artifacts. There is an old steam donkey and some other miscellaneous and large logging equipment around the back side. I unfortunately do not know what is inside as it’s rather limited hours has made it impossible for me to visit. What is interesting though is that it’s housed in a historic and unique octagonal church building. The church dates from 1897 and still sports some nice stained glass windows. In the downtown district, which itself is rather historic is the Bohemia Mining Musuem. As it’s name states it shows the history of the nearby Bohemia Mining district and is run by the Bohemia Mine Owners Association. Again, it’s small, but the amount of information both in old news paper clippings and available via the staff is outstanding. I highly recommend both this museum, and the BBQ place next door.